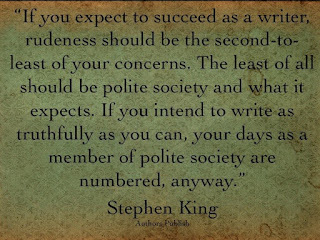 I've been reading Stephen King (one of the best selling crime writers in the world) in his book On Writing and his thoughts on character and dialogue. He has some strong opinions. He does not believe you should describe people's clothes or appearance too much. Rather you should leave it to the imagination of the reader, a few broad brushstrokes - not every spot and pimple. He gives examples and I can see his point clearly. He creates a scene - a dark bar, throws in a few people - you don't want the story held up by long descriptions of those characters - they are there to paint the scene, create the atmosphere, perhaps they'll be part of the plot, perhaps not, we don't know yet. So as I'm sitting here in my local café, drinking my green tea I thought I'd try a bit of character description about a few people passing the window or sitting at the bus stop. You can tell me if the character appears lifelike or not. It's been snowing on this April day, so everyone is wrapped up to the eyeballs - it should be Spring, the blossoms are on the trees and we're all sick to death of our winter clothes. Quite a few people are passing up and down the pavement and it's actually quite difficult to describe them without a situation to put them into. Which is exactly what Stephen King was saying - when he writes a new book, he starts with a situation and a couple of characters in that situation. He says then he's like an archaeologist with a small trowel, digging and releasing bits of the story and he often has no idea how it's going to end. The characters and how they handle the situations develop a life of their own and he says that often the ending surprises him, he didn't see it coming. So for all those how-to-write books or those who like to plan everything in advance - chew on that! STEPHEN KING DOES NOT PLAN HOW HIS BOOKS TURN OUT. HE DOES NOT SIT DOWN AND WRITE OUT A FRAMEWORK AND A PLOT before he starts writing a book. Writing a book is not about planning and following a prepared design or formula. There's a woman leaning against the outside glass next to me, she has limp blonde hair, the corners of her mouth are drawn down, she's wearing (you see I DO want to describe her clothes) bright pink and black patterned leggings and a thick long grey woven coat. She has two bags of shopping and is smoking a thin rolled cigarette. She has the look of someone who's got a lot to think about. Now if you were a novel writer where would you place her in your story? And although I see Stephen King's point about leaving much of the description to the reader's imagination, maybe it's an author gender difference but I like some clothes description. Those bright black and pink leggings were a bit of a statement weren't they? They say, this woman is not shy and retiring, she's got the confidence to wear striking patterns and colours. And leaning against the café window having a fag - that's a statement too - I'm tired and I don't care what you think, I've had a difficult day. And when I get home I'm going to pour myself a large glass of Cabernet Sauvignon and throw a steak under the grill and damn the lot of you. Actually can you see what's happening here - Stephen King's right, my little silver trowel is already beginning to dig around and to weave a story around the woman in her pink and black leggings. I was just thinking, what situation shall I put her in - but that's the wrong way round for Stephen King - he starts with the situation, then the characters. Still the woman is beginning to inhabit my mental landscape, there is a story forming around her. A short story I wrote before, came about when I was given a postcard at a writer's workshop - it was a photo of a young girl in a winter coat with a large star of David attached to the front of the coat. A Jewish kid from the ghetto before World War II. A whole 5000 word story emerged from seeing her on that postcard. She and her story came alive in my mind, it wanted to get out, it had to be told. The thing is, although Stephen King's words echo in my head and he's certainly got me reflecting, he's writing about his own writing processes (which is useful to hear about), but we all have different ways to create on that blank page in front of us. 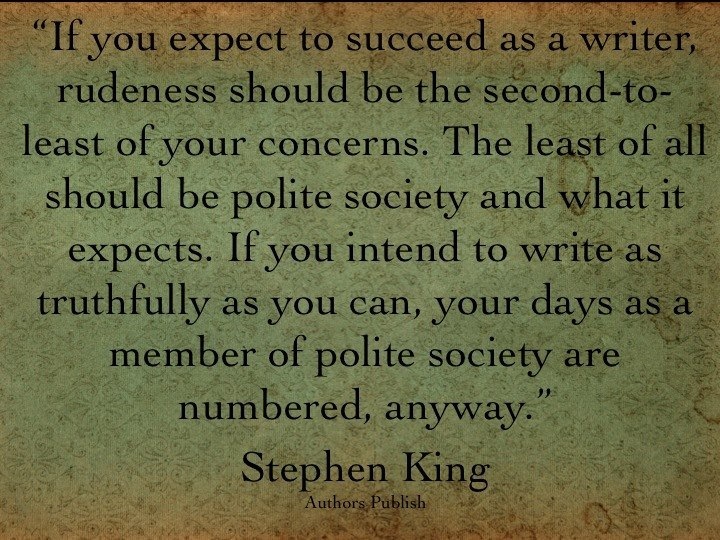 From what I've read in his book so far I think Mr King would probably agree with me. He's not writing a rule book for writers, rather he's musing about his own (and other writers he follows) writing processes and trying to delve into how it all works. And I thank him for that. Now about that woman in the black and pink leggings ... who's she going home to? Where's my silver trowel?